Imagine whiling away the day on a vast stretch of golden sand, overlooking crystal-clear waters. That’s the reality at Surin Beach, among the most popular in Phuket. Located on the west side of the island, this beach is great for parasailing and jet skiing. After a simpler pace? Why not stop at one of the many stalls selling fresh coconuts and enjoy a refreshing drink on the beach? There are also plenty of hotels nearby, so you can take advantage of fine restaurants and wine bars at sunset. The perfect spot for water sports, this five-mile-long sweep of white sand is one of the best places on the island. 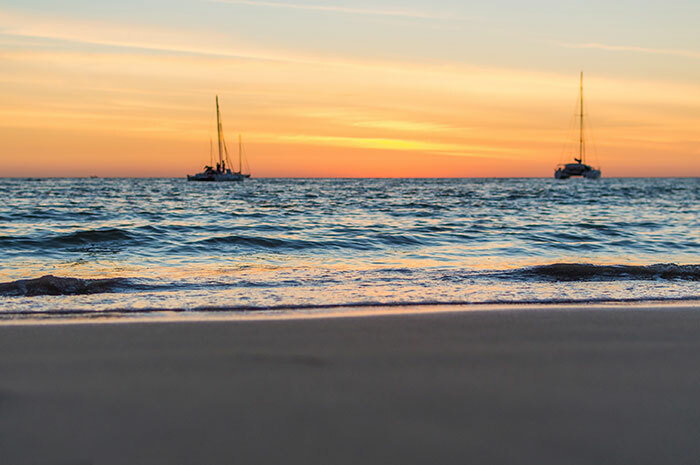 The beach is so long and wide that it never feels crowded, and you can try your hand at a host of activities, including paragliding, water skiing and windsurfing. The northern tip of the beach is the best place to go for a chance to get the sands all to yourself. At sun down, head to Xana Beach Club, where you’ll find cabanas, cocktails and DJs. One of Phuket’s smaller beaches, Kata Noi still packs a punch. 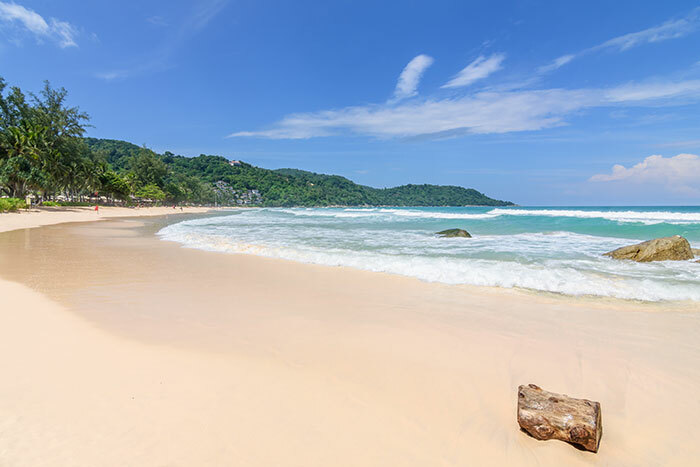 Just a few minutes’ drive from Kata Beach, this is one of the best beaches for surfers in the monsoon season between May and October. The snorkelling here is also superb. Don’t miss Kata Viewpoint – this spectacular vista looks out over the three bays of Karon, Kata and Kata Noi. Go at sunset to see the landscape bathed in golden light. 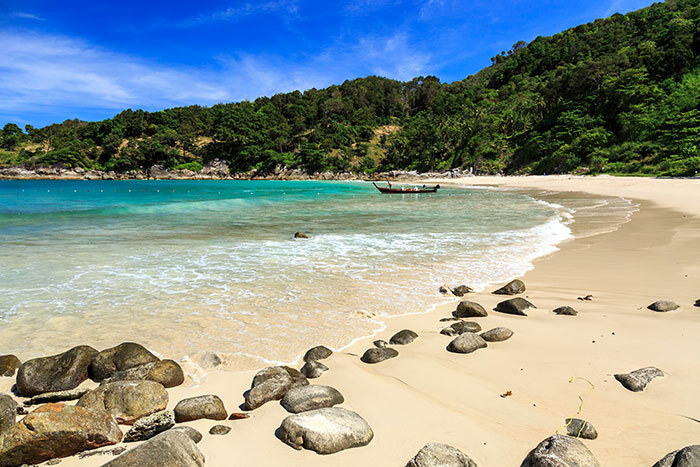 Your first glimpse of this mesmerising beach will be from the ocean – the white sands of Freedom Beach are only accessible by boat. Once you arrive, you’ll step onto a strip of sand set in a jaw-dropping bay which is surrounded by thick jungle. You’ll also notice how blissfully quiet it is; there are no jet-skis here. The shallow waters at the end of the beach are home to incredible flora and fauna; perfect for snorkelling. This is the beach the locals don’t want you to find. Situated between Bang Tao and Nai Thon beaches, Banana Rock can be tricky to track down, but once you do, we guarantee it’ll be tough to tear yourself away. A tiny cove boasting white sands, cerulean waters and swaying palm trees, one of the best things about this incredible beach is the seafood restaurant which sits right on the sands. Take a seat in the shade of the trees and tuck into fresh catch of the day, before enjoying a soothing beachfront massage. 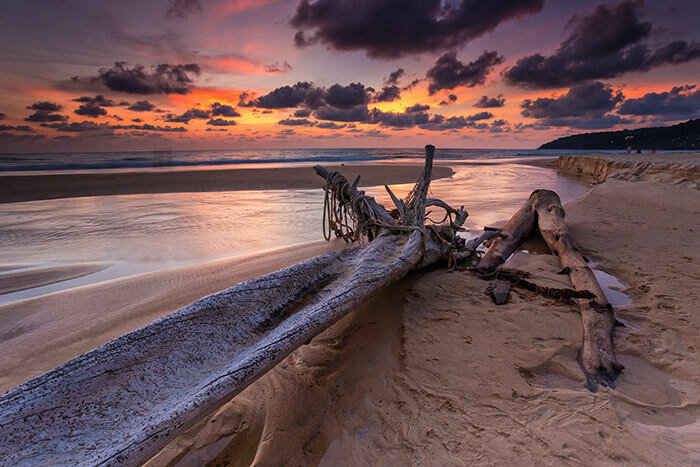 The third longest beach in Phuket is where you’ll find some of the best coral reefs on the island. Dive into the azure waters and discover the colourful marine life, before tucking into delicious street-style seafood. 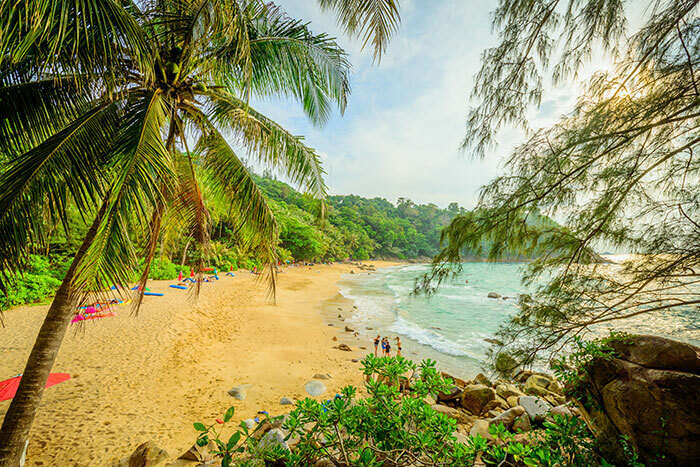 This beach is also known as the best spot in Phuket for windsurfing, while Karon Market is the place to be on Tuesday and Saturday afternoons; don’t miss the chance to taste the steaming dumplings and massam curry. Book your Thailand holiday today – chat to a Flight Centre Travel Expert to find out more.